Guru Sengé Dradrok (Skt. Siṃhanāda; Tib. གུ་རུ་སེང་གེ་སྒྲ་སྒྲོག་, Wyl. gu ru seng ge sgra sgrogs; Eng. 'The Lion's Roar') — one of the Eight Manifestations of Guru Rinpoche. Guru Rinpoche challenged and defeated five hundred upholders of wrong views in debate at Bodhgaya. 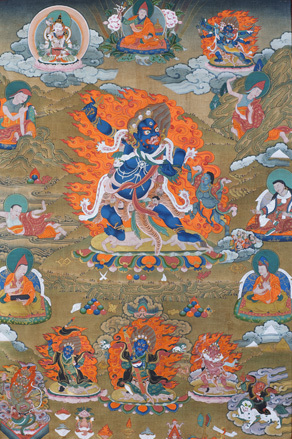 He reversed their magic with the aid of a wrathful mantra given him by the lion-faced dakini Marajita. He is known as Sengé Dradok, 'The Lion's Roar'.